Vijayan J, Wilder-Smith EP. 18 September 2016, posting date. Neurological manifestations of leprosy. In Scollard DM, Gillis TP (ed), International textbook of leprosy. www.internationaltextbookofleprosy.org. Leprosy is one of the most common infectious diseases associated with the peripheral nervous system and frequently results in disability if early treatment is delayed. Thus, the early recognition and prompt treatment of neural involvement is of paramount importance. A review of patients referred to the Hospital for Tropical Diseases in London, UK, showed a median time from symptom onset to diagnosis of 1.8 years (0.2–15.2). Prior to their referral, the patients had seen dermatologists, neurologists, orthopedic surgeons, and rheumatologists. A delay in diagnosis occurred in 82% of the cases, and misdiagnosis, as in other neurological conditions, was an important cause of the delay. Consequently, 68% of the patients had nerve damage resulting in disability . In countries with more familiarity with leprosy, delayed diagnosis tends to be less severe, but still leaves room for improvement . Increasing migration from countries with high rates of leprosy to those with low rates will further compound the problem of unfamiliarity with the clinical picture of leprosy. For the reasons just mentioned, a substantial proportion of patients with leprosy (e.g., Brazil ~1.5 per 100,000 population) have chronic grade 2 disabilities (visible impairments and deformities) at the time of their initial presentation. Nerve function impairment (NFI) at initial presentation is common and occurs at rates as high as 55% . Detailed investigative studies, like nerve conduction studies and thermal threshold tests, have been shown to further improve the detection of neural involvement in patients with leprosy at both an early and a late stage . This improvement suggests that clinical neuropathy represents only the ‘tip of the iceberg’ of nerve damage. In their study of 396 patients in Nepal, Van Brakel et al. reported an incidence of NFI in up to 36% of patients at their initial presentation, with sensory nerve impairment being more common than motor dysfunction . The INFIR (ILEP Nerve Function Impairment and Reactions) study noted an incidence rate of NFI in up to 38% of newly diagnosed multibacillary leprosy (MB) patients . The ALERT MDT Field Evaluation Study (AMFES), which examined 594 newly diagnosed patients and followed up over 10 years, noted the rate of disability from NFI at presentation at 55%. Follow-up evaluation of these patients showed that a further 12% of patients developed new NFI after starting multi-drug therapy . The pathogenesis of nerve involvement with Mycobacterium leprae infection is discussed elsewhere (see Chapter 9.1). However, it is important for the clinician to remember that, apart from genetic susceptibility (see Chapter 8.1), the intensity of exposure, which is reflected in the number of bacilli and the duration of exposure, affects the likelihood of succumbing to clinical leprosy. Leprosy is a chronic, systemic granulomatous disease mainly involving the peripheral nerves and the skin. Less commonly affected areas include the mucus membrane of the upper respiratory tract, the anterior chambers of the eyes, and the testes. Diagnosis is primarily clinical (see Chapter 2.1). The cardinal signs of leprosy are hypopigmented or reddish patches of skin with a loss (or alteration) of sensation, enlarged peripheral nerves, and the demonstration of acid-fast bacilli on skin smears or skin biopsies. The presence of all three criteria has 97% sensitivity and 98% positive predictive value for a diagnosis of leprosy, with excellent validity . There is, however, a subset of patients who have a pure neural disease with no associated involvement of the skin. These patients require a nerve biopsy to confirm the diagnosis. The first neurological manifestation is often the development of sensory loss or paraesthesias in one or more cutaneous skin patches. Further evolution in clinical symptomatology from this stage depends largely on the cellular immune response of the host to the bacilli. The neurological manifestations occur as a result of any of the following mechanisms: involvement of the intracutaneous neural network, involvement of the larger nerves in cooler locations, or inflammation within the larger nerves during the course of the disease when leprosy reactions occur. The earliest manifestation of leprosy is the involvement of the cutaneous nerve, resulting in a loss of thermal sensation as the initial deficit and then evolving to involve other modalities like pain and touch . Sensory modalities subserved by larger fibers are lost in more advanced stages of the disease. Motor manifestations also occur during the latter stages of the disease. There are two classification systems in clinical use for the management of leprosy. The Ridley-Jopling classification system (see Chapter 2.4), which is based on the M. leprae-specific immunological resistance status of the host, is widely used and provides a good understanding of the underlying pathophysiological disease process . This classification system uses the concept of spectral leprosy based on clinical, immunological, and histopathological criteria. At one end of the spectrum is the tuberculoid form (TT), in which a very robust cell-mediated immune response is mounted by the host. At the other end is the lepromatous form (LL), in which the immune response is lackluster. Between these two forms lies borderline leprosy, which has a varying and unstable immune response. Patients with borderline leprosy are immunologically unstable and are particularly at risk of developing leprosy reactions (see Chapter 2.2). The WHO classification system, which is more of a therapeutic classification system, is based on the number of skin lesions present . According to this system, leprosy is classified as paucibacillary (PB), if there are fewer than five hypopigmented anesthetic skin lesions and/or only one nerve trunk involved, or MB, if there are five or more skin lesions and/or more than one nerve trunk involved. The TT and borderline tuberculoid (BT) forms of the Ridley-Jopling classification are equivalent to the PB form in the WHO system, while the borderline borderline (BB), borderline lepromatous (BL), and LL are equivalent to the MB form. The WHO classification system serves as a good guide on the type and duration of treatment, with a longer duration required for the MB form. The neurological manifestations of leprosy are confined to the peripheral and cranial nerves, with anecdotal reports of the involvement of the spinal cord. Peripheral nerve targets are the dermal nerve fibers and nerve trunks. The temporal profile of the illness and the distribution of neural damage depend to a large extent on the bacterial load within the nerve and, more importantly, on the immunological response (see Chapter 6.3) mounted by the host against the infected nerves. Involvement of the peripheral nerves can be in the form of several clinical patterns, mentioned below. The typical clinical presentation of leprosy includes dermatological manifestations with peripheral nerve damage. Common skin lesions include macules or plaques, which are often located on the trunk and abdomen but can occur at any location. A typical lesion has a raised edge, central hypopigmentation, and reduced sensation. Initially lesions develop insidiously. The involvement of a small cutaneous sensory branch with a resultant circumscribed area of sensory loss is the most common initial neurological manifestation. There may be associated anhidrosis of the anesthetic skin patch if the small unmyelinated autonomic fibers are involved. The subsequent evolution of the neurological disease is quite varied and is dependent on the type of immune response. A patient mounting a good cellular response, such as that seen in tuberculoid leprosy, typically will have a mononeuropathy or mono-neuritis multiplex, as the bacilli are confined to a few nerves as a result of the more efficient and intense immune response. The nerves commonly involved in tuberculoid leprosy are the superficially located nerves, such as the ulnar and the common peroneal nerve, where it has been postulated that the cooler temperatures of these regions favor bacterial proliferation. Those with lepromatous leprosy and the corresponding heavy bacterial load have more diffuse involvement of the peripheral nerves and often present with a symmetrical polyneuropathy. Those with borderline types of leprosy manifest with mono-neuritis multiplex, which can evolve into a confluent polyneuropathy if there is a downgrading in the immune response. Figure 1 depicts the three patterns of nerve damage seen across the immune spectrum. FIG 1 Patterns of nerve damage seen across the immune spectrum. Diffuse nerve thickening noted of the supra-orbital, facial, and greater auriclar nerves in the face and neck respectively. There is also diffuse nerve involvement of the nerves of the upper and lower extremities. These include the ulnar, radial, dorsal cutaneous brach of the ulnar and superfical radial nerve in the upper extremities, and the common peroneal, superfical peroneal and sural nerves in the lower extremities. Clinical evaluation shows areas of decreased sensory perception (darkened area of the skin) with a pattern consistent with a symmetrical polyneuropathy. This pattern is compatible with lepromatous leprosy. Patient with borderline leprosy with a pattern consistent with a mononeuritis multiplex and sensory loss that is patchy and asymmetrical. Dermatological involvement will be more patchy with a moderate amount of skin lesions. Patient with tuberculoid leprosy showing restriction of disease to isolated skin and nerve areas. The clinical assessment should include a detailed examination of the skin for hypopigmented areas and of the superficially located nerves for enlargement and tenderness. Nerves that are commonly enlarged include the supraorbital nerve, the greater auricular nerve, the ulnar nerve including its deep ulnar branch, the superficial radial cutaneous nerve, and the peroneal nerves (Figure 2). A detailed and careful sensory examination also is vital, as most patients during the initial stages of their illness may not be aware of their sensory loss. Positive phenomena such as paraesthesias, pain, and hyperhidrosis are less common. Sensation in the dermatomal distribution of each of the peripheral nerves in both the upper and lower extremities should be evaluated. Motor manifestations are common in patients with leprosy and occur later than sensory symptoms. The pattern of motor dysfunction depends on the peripheral nerve involved, with weakness confined to the muscles subserved by the diseased nerve. However, with the progression of the disease the patient would have a more diffuse involvement of multiple extremities. The ulnar and median nerves are commonly involved, which may result in the partial or complete clawing of the hand. Involvement of the peroneal nerve at the fibular head can lead to foot drop and posterior tibial involvement to weakness of plantar extension. However, the proximal muscles of the extremities tend to be spared. Leprosy in up to 4–8% of patients may be confined to the peripheral nerves (PNL), with no associated dermatological involvement . The absence of typical dermatological features greatly decreases the accuracy of clinical diagnosis and necessitates histological confirmation by nerve biopsy. These patients are particularly vulnerable to misdiagnosis, with an increased subsequent occurrence of permanent nerve damage. Differentials include mononeuritis multiplex caused by dysimmune neuropathies and vasculitic illnesses. An awareness of the pure neuritic leprosy (PNL) form and a high index of suspicion are required for an early diagnosis. Jardim et al. assessed 49 patients with PNL and observed paraesthesias to be the most common manifestation occurring in 55% of patients, followed by motor dysfunction in 24%, neural tenderness in 12%, and sensory loss in 8% . In terms of the pattern of involvement, the most common presentation was mono-neuritis multiplex, occurring in 61% of the patients, followed by mononeuropathy in 33%, and polyneuropathy in only 6% . Commonly affected nerves in PNL include the posterior tibial, peroneal, ulnar, and median nerves. The diagnosis is made either by demonstrating histological features (see Chapter 9.1) consistent with leprosy or by establishing the presence of acid-fast bacilli within the nerve. Nerves that are most suitable for biopsy are the dorsal ulnar cutaneous, the medial/lateral antebrachial, or the superficial radial or sural nerves. A nerve biopsy can be problematic as it is limited by sampling error, because most PNL patients fall into the TT or BT portions of the spectrum with a decreased bacillary load. However, there is evidence that a nerve ultrasound may be able to reduce the sampling error . Acute neuritis in leprosy tends to occur during the leprosy reactions. A large clinical study found that 6.9% of neuritis occurred without other signs of reactions . A change in the immunological status of the patient before the initiation of treatment, during treatment, or after the completion of treatment may cause worsening of the neurological manifestations. These neurological manifestations occur in up to 30% of patients with MB disease, especially in those within the borderline category . Neural damage tends to occur more commonly in Type 1 (reversal) reactions (see Chapter 2.2), which are more common in borderline forms of the disease. Increased T-cell reactivity to mycobacterial antigens is associated with the infiltration of interferon gamma (IFN-γ) and TNF-α secreting CD-4 positive lymphocytes into the skin and nerves, resulting in edema and painful inflammation as well as increased serum cytokine concentration . Cytokine levels decrease with corticosteroids, so a poor response to corticosteroids would mean persistently high cytokine levels and an increased likelihood for a relapse of neuritis after steroid withdrawal. The onset of acute neuritis often starts with spontaneous nerve pain, paraesthesias, and nerve tenderness. These symptoms are followed by nerve function impairment with objective sensory-motor loss. Recognition of the symptoms at onset is crucial, as initiation of steroids reduces long-term damage , . This condition is characterized by the impairment of sensory and motor functions without skin signs, nerve tenderness, or any of the positive symptoms associated with a neuropathic process. This phenomenon occurs more commonly during the leprosy reactions, both type 1 and type 2 (erythema nodosum leprosum). The lack of spontaneous subjective nerve impairment makes this condition detectable only when specifically assessed. This assessment is achieved using standardized monofilament testing for sensory impairment and voluntary muscle strength for motor impairment. Van Brakel et al. estimated that silent neuropathy (SN) occurs in as many as 7% of newly presenting patients at their initial examination, with an incidence rate of 4.1 per 100 person years at risk on follow-up visits. Up to 75% of the silent neuropathy occurs during the first year after the initiation of chemotherapy . With regard to histopathology, SN is characterized by an increased cell-mediated immune reaction and nerve fibrosis. Since these patients do not report clinical symptoms, a regular and detailed nerve function assessment is required on follow-up visits to detect this clinical condition. The use of steroids significantly improves the outcome . Autonomic dysfunction is commonly seen in patients with leprosy and is due to the involvement of small unmyelinated fibers. The autonomic nerves innervating several systems within the body can be affected, leading to widespread dysautonomia . But unlike other diseases, the autonomic impairment is unique in that it tends to be quite regional at the onset. The involvement of individual peripheral nerves or a larger branch can cause loss of vasomotor or sudomotor functions, confined to the innervating territory . A diffuse pattern can be seen in advanced stages of the disease when most of the peripheral nerves are involved. The autonomic impairment in this advanced state of the disease can lead to characteristic dry and cracked skin, which is susceptible to infection and ulceration (Figure 3). Early identification of this dysfunction is important, as the institution of skin care has important implications with regards to improved wound care and avoidance of deformities . Late into the illness, there can be cardiac and respiratory dysautonomia , . It has been suggested that the frequent subclinical autonomic involvement in otherwise healthy contacts of leprosy patients is proportional to the intensity of contact with M. leprae and represents a lasting remnant of the immune interaction akin to the Gohn focus in M. tuberculosis . Cranial nerve involvement is common in leprosy, occurring in 10–17% of patients, with the facial and trigeminal nerves being most frequently involved . Akin to peripheral nerve involvement, the disease tends to involve one of the branches of the nerves. These branches are involved in a scattered pattern, with the zygomatic branch of the facial and maxillary division of the trigeminal nerve being affected the most. Clinically, these patients manifest with lagophthalmos, corneal xerosis, and anesthesia with ulcers and facial muscle weakness. Superficial nerve enlargement of the supraorbital and greater auricular nerve can serve as a clue in the early diagnosis of leprosy , . Other less commonly involved cranial nerves include the vestibulocochlear, the glossopharyngeal, the vagus, and the hypoglossal nerves. There are also reports of multiple cranial nerves being involved, presenting with cranial polyneuritis multiplex . Pain is a common but until recently neglected symptom in leprosy that is mediated and maintained through several mechanisms. Neuritis is the most readily identifiable source of pain and mostly occurs acutely with a neural inflammatory response. However, recent studies have shown that neuropathic pain can arise several years after the completion of leprosy chemotherapy . Of those with acute neuropathic pain (seen in 11–22% of patients), up to 56% develop chronic pain . In another study, 85% of patients with leprosy-related neuropathic pain developed pain after the completion of antibacterial treatment . Pain can manifest in the form of paraesthesias, dysesthesias, hyperesthesia, and allodynia along the nerve and in its area of distribution . Pain in leprosy has been observed to follow different time-based patterns. Acute nociceptive pain is usually not associated with sensory impairment and usually occurs in the setting of leprosy reactions. However, if the inflammatory neuritis is associated with sensory loss, it is considered acute neuropathic pain. Chronic neuropathic pain is caused by a disease of the somatosensory system and usually tends to involve the neuroanatomical distribution of the nerve. The underlying pathophysiological mechanism of pain includes excessive firing of pain mediating nerve cells that are not sufficiently controlled by segmental and non-segmental inhibitory circuits. Pain mediating fibers are small fibers. The presence of sensory-motor impairment and a history of type 2 reactions are known risk factors for the development of chronic neuropathic pain. The pain is presumed to be due to the presence of residual bacterial antigens within the Schwann cells, which elicit an inflammatory response and lead to nerve damage (see Chapter 9.2). The distribution of pain in leprosy also may assume the pattern of the neural involvement, with a more diffuse involvement in the case of MB or a patchy distribution of pain in PB cases of mononeuritis multiplex , . There are several severity scales that grade the pain intensity in leprosy . It is important to remember that pain in leprosy can also result from extra neural pathology such as osteitis, periosteitis, and osteomyelitis (see Chapter 2.4). The most important goal in the management of leprosy is the prevention of disability via early detection of nerve function impairment. Patients suspected to have leprosy should have a careful assessment of sensory and motor functions. Several methods are used in the detection of nerve function impairment, ranging from simple bedside examination using a ball point pen to more sophisticated electrophysiological examination techniques. The use of more sensitive detection methods has improved the diagnosis of sub-clinical neuropathy in leprosy. The use of a Q-tip for a soft touch or a disposable needle for pain is simple, using tools that are readily available but difficult to quantify. Monofilament testing, which can semi-quantitatively determine sensory loss, is a favored technique and has been shown to correlate well with neurophysiological abnormalities . Nerves tested in the upper extremities should include the ulnar, median, and the radial cutaneous nerves. For the lower extremities, the nerves tested should include the posterior tibial and the sural nerves. Motor examination should specifically focus on commonly involved nerves, including the ulnar nerve (intrinsic hand and hypothenar muscles), the median nerve (thenar and flexor muscles), the peroneal nerve (foot dorsiflexors), and the posterior tibial nerve (foot extensors). All branches of the trigeminal nerve and the facial nerve should be tested. In order to detect developing nerve damage early, a monthly clinical evaluation with monofilament testing and voluntary muscle testing is a minimum standard requirement in the first six months to one year after commencement of treatment. The AMFES recommends that five basic signs be examined in all patients with leprosy. These signs include skin lesions consistent with leprosy, loss of sensation in such a lesion, thickening of the ulnar nerve, loss of sensation in the palms and soles of the feet, and the presence of acid-fast bacilli in skin smears. The presence of any two is regarded as diagnostic of leprosy . Standardization of the examination techniques is essential for follow-up assessment of patients with leprosy. Initial assessment includes sensory evaluation using Semmes Weinstein monofilaments (MF) and motor assessment using Voluntary Muscle Testing (VMT). For sensory evaluation, MF ranging from 200mg to 300gm are used on several fixed dermatomal points supplied by the major nerves of the upper and lower extremities. This technique, first described by Bell-Krotoski, is an accurate and reproducible clinical method of documenting sensory functions. Touch sensibility is tested with a standard set of five colored Semmes-Weinstein MF. When applied with a force sufficient to bend the filament, the five MF are respectively equal to application forces of 50 mg – score 5, 200 mg – score 4, 2 g – score 3, 4 g – score 2, and 300 g – score 1. These MF are applied on standardized parts of the extremities and a composite score is derived , . Motor assessment includes testing of eye closure, little finger abduction, palmar abduction of the thumb, wrist extension, and foot dorsiflexion, graded using the modified Medical Research Council (MRC) six-point scale of 0–5, with 5 representing normal strength . Depending on the availability of tests, standardized clinical assessment techniques can be followed by a battery of investigations that include sensory and motor conduction studies, assessments of warm and cold sensation, vibration perception thresholds, and muscle strength testing using dynamometry. The development of neuropathy in patients with leprosy has important prognostic and long-term implications. Several risk factors have been associated with the development of NFI in patients with leprosy during the course of their illness. These factors include extensive MB disease, borderline leprosy during the first year of disease, pregnancy and puerperium, enlargement of the ulnar nerve, and a positive lepromin test. The Bangladesh Acute Nerve Damage Study (BANDS) carried out at the Danish Bangladesh Leprosy Mission developed a simple model to predict the development of nerve function impairment in patients at their initial clinical presentation. The variables include the type of leprosy (PB or MB) and the presence of NFI at the time of first presentation . Patients with PB leprosy and no nerve-function loss had a 1.3% (95% CI 0.8–1.8%) risk of developing NFI within 2 years of registration; patients with PB leprosy and nerve-function loss, or patients with MB leprosy and no NFI, had a 16.0% (12–20%) risk; and patients with MB leprosy with NFI had a 65% (56–73%) risk. Knowledge of the risk of possible NFI allows the implementation of appropriate follow-up surveillance , . The INFIR study done on a cohort of 303 multibacillary patients in India with a follow up at two years found that the presence of skin lesions overlying a nerve trunk was the strongest predictor of subsequent neuropathy . Overlying skin lesions increased the risk of sensory and motor impairment in the concerned nerve by 3–4 times. For such nerves, reactional signs in the lesions further increased the risk by 6–8 times. A second INFIR cohort showed that a change in the TNF-α level before an ensuing neuropathy was a statistically significant predictor of NFI . The AMFES (performed in Ethiopia) reported that older age, delay in diagnosis, thickened nerves at diagnosis, and reversal and ENL reactions were risk factors for the development of chronic or recurrent neuropathy. Electrodiagnostic studies provide good corroborative evidence of neural involvement in patients with neurological symptoms and signs. Occasionally, they can also be of use in the detection of pathology in those who are asymptomatic. Electrodiagnostic techniques give a good assessment of the functional characteristics of neural damage in terms of either motor or sensory dysfunction. A nerve ultrasound is an evolving imaging modality that can be of significant utility in the assessment of the structural integrity of the peripheral nerves. The confirmation of a suspected diagnosis is based on the overall clinical picture combined with additional histological/bacteriological features obtained through a skin or nerve biopsy. A nerve conduction study, when available, is the investigation of first choice for corroborating the neurological findings in patients with leprosy. The investigation provides robust functional assessments of the ulnar, median, and radial nerves in the upper extremities and of the posterior tibial, the common peroneal, and the sural nerves in the lower extremities. Parameters commonly assessed are the distal motor latency, sensory peak latency, compound muscle action potential amplitude, sensory nerve action potential amplitude, and motor and sensory conduction velocities. Assessment of these parameters can elicit the underlying nature of the large fiber nerve involvement in leprosy. The pattern of nerve conduction abnormalities can be both axonal and demyelinating. Demyelinating features are observed earlier at sites of nerve entrapment, such as that of the ulnar nerve at the elbow . With further nerve damage, there is evidence of axonal pathology with reductions in the sensory nerve and compound muscle action potential. Nerve conduction studies have been demonstrated to be more sensitive than clinical assessments in the detection of neuropathy. The INFIR cohort study evaluated a group of 188 patients with MB leprosy who had no sensory or motor impairment at baseline over a period of two years for NFI. These patients were prospectively assessed using the modified MRC scale and grip dynamometry for motor nerve function and MF testing for sensory nerve function. Patients also were subjected to nerve conduction studies, vibration perception threshold testing, and thermal threshold testing during follow up at 4–8 weekly intervals. Subclinical neuropathy was detected with sensory nerve conduction studies and warm perception threshold testing up to 12 weeks or more before clinical conversion occurred. The radial and sural nerves were the most frequently affected, and the authors suggested that these nerves be assessed in monitoring neural damage . Nerve conduction studies of superficially located nerves like the ulnar, sural, radial cutaneous, and common peroneal are commonly abnormal. The median nerve is less commonly involved, but again shows more sensitivity in the detection of early neuropathy than a clinical motor examination. Quantitative sensory testing (QST) is a reliable method of evaluating the functions of the C-fibers and the A-delta fibers that are involved early in patients with neuropathy from leprosy. These types of nerve fibers are not evaluated by conventional nerve conduction studies. Several studies have shown that abnormal warm perception threshold or QST is one of the earliest features . There are several excellent reviews on the methodology of performing QST using several test algorithms. The basic premise of QST is to measure the detection threshold of accurately calibrated sensory stimuli. The stimuli are delivered through the test electrode (thermode), which is in contact with the subject’s skin. Then the subject is asked to report a sensation of temperature change or heat pain . Cranial nerve dysfunction with the involvement of the facial and trigeminal nerves can be assessed using MRC graded testing of eye opening and shutting against resistance and MF. The blink reflex provides a further quantitative assessment of neural involvement . A nerve ultrasound (12–18 MHz) demonstrates high-resolution imaging for the evaluation of peripheral nerve disorders. It provides a good morphological assessment of long segments of all of the major peripheral nerves in the upper and lower extremities , . The superficially located nerves, which are especially vulnerable to leprosy, can be evaluated in greater detail for thickening, nerve edema, micro-abscesses, and alteration of fascicular architecture. 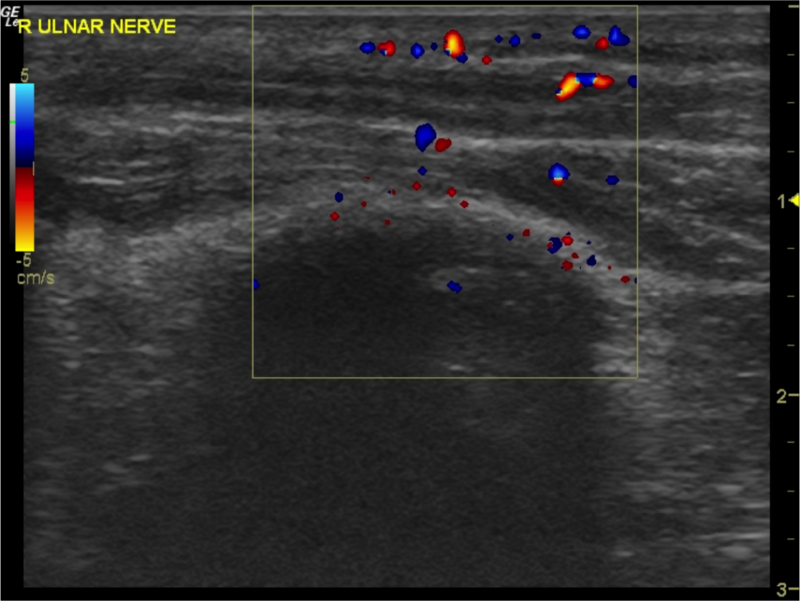 The additional advantages of nerve ultrasound include the capacity to assess deeper nerves that are not palpable, a more precise method of measurement of the nerve enlargement with less inter-observer variability, and a good follow-up tool to assess the morphological changes with treatment . The nerves that can be assessed include the ulnar nerve, median nerve, and radial nerves in the upper extremity. Other nerves that are well visualized in the upper extremity include the superficial radial cutaneous nerve, the dorsal ulnar cutaneous nerve, and the medial antebrachial nerve. The distal sciatic nerve, and its terminal bifurcation into the common peroneal nerve and posterior tibial nerve in the popliteal fossa, and the sural nerve in the distal lower extremity are also well visualized. 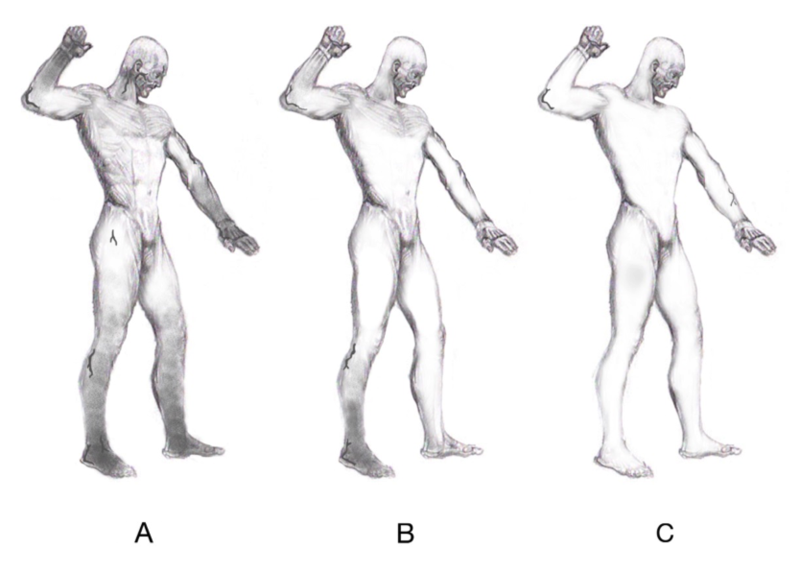 Studies have shown a good correlation between a clinical weakness of ulnar innervated muscles and motor conduction slowing across the elbow, with the maximum degree of nerve enlargement above the sulcus ulnaris (Figure 4) , . Imaging studies including color Doppler studies for assessment of an increase in endoneural vascularity (Figure 5) and gadolinium-DTPA enhanced MR scans have been found to be useful in the detection of active reversal reactions in patients initiated on multi-drug chemotherapy . Objective sonographic methods used to indirectly evaluate the small unmyelinated nerve fibers include the assessment of skin and muscle vasomotor reflexes using Doppler flow velocimetry . Focused radiological investigations of the bones and the joints are also important in patients with nerve function impairment, as these patients are at an increased risk of developing ulcers and subsequent osteomyelitis, neuro-osteoarthropathy, and subsequent amputation of the affected limb. Techniques used to evaluate these conditions include MR and CT imaging . The diagnosis of leprosy is confirmed by histopathological studies of patients with a suggestive neurological presentation and associated dermatological findings. Slit-skin smears and skin biopsies demonstrating acid-fast bacteria often provide diagnostic confirmation. However, in patients with pure neuritic Hansen’s disease, a nerve biopsy is required to confirm the diagnosis. The histopathological features (see Chapter 9.1) seen on a nerve biopsy determine the subtype of the neuropathy within the spectrum of the Ridley-Jopling classification system. Findings in patients with robust cell-mediated immunity include well-defined tuberculoid granulomas and nonspecific lymphocytic inflammatory infiltrates with scarce or no bacilli. In patients with poor cell-mediated immunity, granulomas mostly contain vacuolated foamy cells and bacilli. During reactions, intraneural caseous necrosis and micro-abscesses can be seen . Histopathological studies have several pitfalls. The inflammatory infiltrate of the nerves may be distinct from the ones in the cutaneous lesion, being MB in the nerves and PB in the skin. These studies may not always be able to differentiate a relapse from a reversal reaction ,  (see Chapter 2.4). The diagnosis of pure neural leprosy can be aided by fine needle aspiration cytology of the affected nerve, preferably identified as having morphological abnormality with an increased blood flow through a nerve ultrasound. This approach may reduce sampling error and increase the specificity of diagnosis by linking cytological studies with Fite-Faraco staining and polymerase chain reaction (PCR) for extractable M. leprae DNA ,  (see Chapter 5.1). The neurological manifestations of leprosy are restricted to the peripheral nervous system, and the clinical patterns are dependent on the hosts’ immune response to the M. leprae infection. The association with typical cutaneous lesions provides convenient disease identification and classification. Nerve involvement commonly manifests with a sensory abnormality, which progresses to painful neuritis and finally results in severe sensory motor deficits typically characterized by the loss of digits. An absence of typical skin manifestations, as occurs in pure neural leprosy, mandates histological confirmation. The high rates of migration from countries with high prevalence rates of leprosy to those with low rates present a challenge and require accurate knowledge of the disease expression. A failure to detect leprosy early is common and leads to the development of permanent disability from nerve damage. ^ Da Silva Souza C, Bacha JT. 2003. Delayed diagnosis of leprosy and the potential role of educational activities in Brazil. Lepr Rev 74(3):249–258. ^ Saunderson P. 2000. The epidemiology of reactions and nerve damage. Lepr Rev 71(Suppl):S106–110. a, b, c van Brakel WH, Nicholls PG, Wilder-Smith EP, Das L, Barkataki P, Lockwood DN, Group IS. 2008. Early diagnosis of neuropathy in leprosy—comparing diagnostic tests in a large prospective study (the INFIR cohort study). PLoS Negl Trop Dis 2(4):e212. ^ van Brakel WH, Khawas IB. 1994. Nerve damage in leprosy: an epidemiological and clinical study of 396 patients in west Nepal—Part 1. Definitions, methods and frequencies. Lepr Rev 65(3):204–221. a, b van Brakel WH, Nicholls PG, Das L, Barkataki P, Suneetha SK, Jadhav RS, Maddali P, Lockwood DN, Wilder-Smith E, Desikan KV. 2005. The INFIR Cohort Study: investigating prediction, detection and pathogenesis of neuropathy and reactions in leprosy. Methods and baseline results of a cohort of multibacillary leprosy patients in north India. Lepr Rev 76(1):14–34. ^ Saunderson P, Gebre S, Desta K, Byass P, Lockwood DN. 2000. The pattern of leprosy-related neuropathy in the AMFES patients in Ethiopia: definitions, incidence, risk factors and outcome. Lepr Rev 71(3):285–308. ^ Sirumban P, Kumar A, Durai V, Neelan PN. 1988. Diagnostic value of cardinal signs/symptoms in paucibacillary leprosy. Indian J Lepr 60(2):207–214. ^ Dastur DK. 1955. Cutaneous nerves in leprosy: the relationship between histopathology and cutaneous sensibility. Brain 78(4):615–633. ^ WHO Expert Committee on Leprosy. 1988. World Health Organization technical report series 768:1–51. ^ Wilder-Smith E. 2002. Diagnosis of pure neuritic leprosy. Neurol J Southeast Asia 7(1):61–63. ^ Jardim MR, Antunes SL, Santos AR, Nascimento OJ, Nery JA, Sales AM, Illarramendi X, Duppre N, Chimelli L, Sampaio EP, Sarno EP. 2003. Criteria for diagnosis of pure neural leprosy. J Neurol 250(7):806–809. ^ Jardim MR, Chimelli L, Faria SC, Fernandes PV, Da Costa Neri JA, Sales AM, Sarno EN, Gomes Antunes SL. 2004. Clinical, electroneuromyographic and morphological studies of pure neural leprosy in a Brazilian referral centre. Lepr Rev 75(3):242–253. ^ Lolge SJ, Morani AC, Chaubal NG, Khopkar US. 2005. Sonographically guided nerve biopsy. J Ultrasound Med 24(10):1427–1430. ^ Scollard DM, Marterlli CM, Stefani MM, Maroja Mde F, Villahermosa L, Pardillo F, Tamang KB. 2015. Risk factors for leprosy reactions in three endemic countries. Am J Trop Med Hyg 92(1): 108–114. ^ van Veen NH, Nicholls PG, Smith WC, Richardus JH. 2008. Corticosteroids for treating nerve damage in leprosy. A Cochrane review. Lepr Rev 79(4):361–371. ^ Manandhar R, Shrestha N, Butlin CR, Roche PW. 2002. High levels of inflammatory cytokines are associated with poor clinical response to steroid treatment and recurrent episodes of type 1 reactions in leprosy. Clin Exp Immunol 128(2):333–338. ^ Walker SL, Lockwood DN. 2008. Leprosy type 1 (reversal) reactions and their management. Lepr Rev 79(4):372–386. ^ Van Brakel WH. 2000. Peripheral neuropathy in leprosy and its consequences. Lepr Rev 71(Suppl):S146–153. ^ van Brakel WH, Khawas IB. 1994. Silent neuropathy in leprosy: an epidemiological description. Lepr Rev 65(4):350–360. a, b Srinivasan H, Rao KS, Shanmugam N. 1982. Steroid therapy in recent “quiet nerve paralysis” in leprosy. Report of a study of twenty-five patients. Lepr India 54(3):412–419. ^ Katoch K. 1996. Autonomic nerve affection in leprosy. Indian J Lepr 68(1):49–54. ^ Wilder-Smith EP, Wilder-Smith AJ, Nirkko AC. 2000. Skin and muscle vasomotor reflexes in detecting autonomic dysfunction in leprosy. Muscle Nerve 23(7):1105–1112. ^ Wilder-Smith A. 1998. Autonomic neuropathy in Leprosy. Neurol J Southeast Asia 3:15–17. ^ Khattri HN, Radhakrishnan K, Kaur S, Kumar B, Wahi PL. 1978. Cardiac dysautonomia in leprosy. Int J Lepr Other Mycobact Dis 46(2):172–174. ^ Gupta OP, Jain AP, Jajoo UN, Kumar K, Parvez K. 1984. Respiratory dysautonomia in leprosy. Indian J Lepr 56(4):844–846. ^ Wilder-Smith E, Wilder-Smith A, Egger M. 1997. Peripheral autonomic nerve dysfunction in asymptomatic leprosy contacts. J Neurol Sci 150(1):33–38. ^ Kumar S, Alexander M, Gnanamuthu C. 2006. Cranial nerve involvement in patients with leprous neuropathy. Neurol India 54(3):283–285. ^ Gopinath DV, Thappa DM, Jaishankar TJ. 2004. A clinical study of the involvement of cranial nerves in leprosy. Indian J Lepr 76(1):1–9. ^ Reichart PA, Srisuwan S, Metah D. 1982. Lesions of the facial and trigeminal nerve in leprosy. An evaluation of 43 cases. Int J Oral Surg 11(1):14–20. ^ Dhar S, Sharma VK, Kaur S. 1993. Facial, glossopharyngeal, vagus and hypoglossal nerve palsy in a case of lepromatous leprosy. Indian J Lepr 65(3):333–336. ^ Haroun OM, Hietaharju A, Bizuneh E, Tesfaye F, Brandsma JW, Haanpaa M, Rice AS, Lockwood DN. 2012. Investigation of neuropathic pain in treated leprosy patients in Ethiopia: a cross-sectional study. Pain 153(8):1620–1624. ^ Lasry-Levy E, Hietaharju A, Pai V, Ganapati R, Rice AS, Haanpaa M, Lockwood DN. 2011. Neuropathic pain and psychological morbidity in patients with treated leprosy: a cross-sectional prevalence study in Mumbai. PLoS Negl Trop Dis 5(3):e981. ^ Saunderson P, Bizuneh E, Leekassa R. 2008. Neuropathic pain in people treated for multibacillary leprosy more than ten years previously. Lepr Rev 79(3):270–276. ^ Haanpaa M, Lockwood DN, Hietaharju A. 2004. Neuropathic pain in leprosy. Lepr Rev 75(1):7–18. ^ Thakur S, Dworkin RH, Haroun OM, Lockwood DN, Rice AS. 2015. Acute and chronic pain associated with leprosy. Pain 156(6):998–1002. ^ Ciampi de Andrade D. 2015. Pain in leprosy: general challenges of a singular disease. Pain 156(6):983–985. ^ Bouhassira D, Attal N, Fermanian J, Alchaar H, Gautron M, Masquelier E, Rostaing S, Lanteri-Minet M, Collin E, Grisart J, Boureau F. 2004. Development and validation of the Neuropathic Pain Symptom Inventory. Pain 108(3):248–257. ^ Roberts AE, Nicholls PG, Maddali P, Van Brakel WH. 2007. Ensuring inter-tester reliability of voluntary muscle and monofilament sensory testing in the INFIR Cohort Study. Lepr Rev 78(2):122–130. ^ Saunderson P, Groenen G. 2000. Which physical signs help most in the diagnosis of leprosy? A proposal based on experience in the AMFES project, ALERT, Ethiopia. Lepr Rev 71(1):34–42. ^ Bell-Krotoski JA, Tomancik E. 1987. The repeatability of testing with Semmes-Weinstein monofilaments. J Hand Surg Am 12(1):155–161. ^ Anderson AM, van Brakel WH. 1998. Age specific normal thresholds for sensibility testing with monofilaments in a Nepali population. Int J Lepr 66:69A. ^ Van Brakel WH, Nicholls PG, Das L, Barkataki P, Maddali P, Lockwood DN, Wilder-Smith E. 2005. The INFIR Cohort Study: assessment of sensory and motor neuropathy in leprosy at baseline. Lepr Rev 76(4):277–295. ^ Croft RP, Richardus JH, Nicholls PG, Smith WC. 1999. Nerve function impairment in leprosy: design, methodology, and intake status of a prospective cohort study of 2664 new leprosy cases in Bangladesh (The Bangladesh Acute Nerve Damage Study). Lepr Rev 70(2):140–159. ^ Croft RP, Nicholls PG, Steyerberg EW, Richardus JH, Cairns W, Smith S. 2000. A clinical prediction rule for nerve-function impairment in leprosy patients. Lancet 355(9215):1603–1606. ^ Croft RP, Nicholls PG, Steyerberg EW, Richardus JH, Withington SG, Smith WC. 2003. A clinical prediction rule for nerve function impairment in leprosy patients—revisited after 5 years of follow-up. Lepr Rev 74(1):35–41. ^ Smith WC, Nicholls PG, Das L, Barkataki P, Suneetha S, Suneetha L, Jadhav R, Sundar Rao PS, Wilder-Smith EP, Lockwood DN, van Brakel WH. 2009. Predicting neuropathy and reactions in leprosy at diagnosis and before incident events—results from the INFIR cohort study. PLoS Negl Trop Dis 3(8):e500. ^ Garbino JA, Naafs B, Ura S, Salgado MH, Virmond M. 2010. Neurophysiological patterns of ulnar nerve neuropathy in leprosy reactions. Lepr Rev 81(3):206–215. ^ Yarnitsky D, Sprecher E. 1994. Thermal testing: normative data and repeatability for various test algorithms. J Neurol Sci 125(1):39–45. ^ Ulvi H, Yigiter R, Yoldas T, Aygul R, Varoglu AO, Deniz O. 2004. Using the blink reflex as measured by electromyogram to assess cranial nerve involvement in people affected by leprosy. Int J Lepr Other Mycobact Dis 72(4):486–491. ^ Stoll G, Wilder-Smith E, Bendszus M. 2013. Imaging of the peripheral nervous system. Handb Clin Neurol 115:137–153. ^ Goedee HS, Brekelmans GJ, van Asseldonk JT, Beekman R, Mess WH, Visser LH. 2013. High resolution sonography in the evaluation of the peripheral nervous system in polyneuropathy—a review of the literature. Eur J Neurol 20(10):1342–1351. ^ Jain S, Visser LH, Praveen TL, Rao PN, Surekha T, Ellanti R, Abhishek TL, Nath I. 2009. High-resolution sonography: a new technique to detect nerve damage in leprosy. PLoS Negl Trop Dis 3(8):e498. ^ Bathala L, Kumar K, Pathapati R, Jain S, Visser LH. 2012. Ulnar neuropathy in Hansen Disease: clinical, high-resolution ultrasound and electrophysiologic correlations. J Clin Neurophysiol 29(2):190–193. ^ Elias J Jr, Nogueira-Barbosa MH, Feltrin LT, Furini RB, Foss NT, Marques W Jr, dos Santos AC. 2009. Role of ulnar nerve sonography in leprosy neuropathy with electrophysiologic correlation. J Ultrasound Med 28(9):1201–1209. ^ Martinoli C, Derchi LE, Bertolotto M, Gandolfo N, Bianchi S, Fiallo P, Nunzi E. 2000. US and MR imaging of peripheral nerves in leprosy. Skeletal Radiol 29(3):142–150. ^ Slim FJ, Faber WR, Maas M. 2009. The role of radiology in nerve function impairment and its musculoskeletal complications in leprosy. Lepr Rev 80(4):373–387. ^ Job CK. 2001. Pathology and pathogenesis of leprous neuritis; a preventable and treatable complication. Int J Lepr Other Mycobact Dis 69(2 Suppl):S19–29. ^ Sehgal VN, Koranne RV, Sehgal S, Beoher PC, Sharma VK. 1985. Correlation of morphological, bacteriological, histopathological and immunological feature of leprosy. A double-blind study. J Dermatol 12(3):243–250. ^ Majumdar S, Srivastava G, Kumar P. 2003. Clinicohistological disparity in leprosy. Indian J Dermatol Venereol Leprol 69(2):178–179. ^ Reja AH, De A, Biswas S, Chattopadhyay A, Chatterjee G, Bhattacharya B, Sarda A, Aggarwal I. 2013. Use of fine needle aspirate from peripheral nerves of pure-neural leprosy for cytology and PCR to confirm the diagnosis: a pilot study. Indian J Dermatol Venereol Leprol 79(6):789–794. ^ Theuvenet WJ, Miyazaki N, Roche P, Shrestha I. 1993. Cytological needle aspiration of the nerve for the diagnosis of pure neural leprosy. Int J Lepr Other Mycobact Dis 61(4):597–599.